Whether raising his family, making a living farming or organizing and building a cotton gin, when Carl Seeliger sets his mind on something, he works until he achieves it. His family has a six generation farming legacy and is proof that with hard work and determination anything is possible – including growing cotton in Kansas. 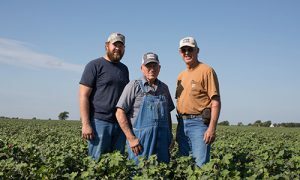 Carl and his son, Mike Seeliger, were the first people to grow cotton in the Cowley County area in Kansas. His journey to growing cotton started one day when Carl was waiting on his wife to meet him for lunch at the fair. He was wandering around, checking out the various booths, when one caught his eye: a cotton gin. The gin shared some information about the benefits of growing cotton. The Seeliger family has raised cotton every year since 1985. After 10 years of hauling their cotton to a gin 150 miles away, Carl and Mike decided something needed to be done. They found a gin for sale in Oklahoma and bought it. A few of them in the community tore it down and hauled it to Winfield, Kan.
Mike said they formed Southern Kansas Cotton Growers cooperative because they wanted it to be a collaboration among all the farmers in the community. Today, Carl is at the helm of his family’s farm, working closely with Mike and his grandson, Brian Seeliger. Carl said he wanted to instill hard work and perseverance in the next generations of his family. He also said working with his family has been the greatest joy of his life. In recent years, Mike’s son Brian has returned to the family farm to carry on the tradition. “One day I got a call and he said, ‘Dad, is there room for a big toolbox in the shop?’ I said ‘Sure, come on home,’ and I have really enjoyed working with him since,” Mike said. “He has the knowledge of a mechanic and is also good when it comes to all the new electronics, with all the GPS, it takes a programmer to program the combines or whatever you are doing.” Brian said he has enjoyed working with his family each day. From the time he was 20 years old, Carl did all of the wheat cutting on the family’s farm. When his grandson came back home to farm he handed over the reins to him, but he still knows what the machinery should sound like when it is running properly. Carl said he has had his fair share of challenges over the years, but he wouldn’t trade it for anything. Carl has created a legacy that his family is proud to carry on. While Elvis Presley is known as the king of rock ‘n’ roll and George Strait is the king of country music, Carl Seeliger is known as the king of Kansas cotton, and of his cotton farming family.